Have you ever checked the ingredients listed on your shampoo bottle? Well, maybe it’s time to squint your eyes and check out what the small letters say. At first, I was intimidated by ingredients such as retinyl palmitate, isopropylparaben and polyethylene terephthalate. But not to worry! Below are three unhealthy or straight-up toxic ingredients to look out for. 1. Sodium laureth sulfate/sodium lauryl sulfate: This ingredient is often contaminated with measurable amounts of ethylene oxide and 1,4-dioxane, which has been shown in multiple studies to harm the nervous system and interfere with human development. 2. Microbeads (e.g. polyethylene (PE), polypropylene (PP), polyethylene terephthalate (PET), polymethlyl methacrylate (PMMA)): Basically, look for ingredients that start with Poly-. Microbeads are plastic particles so small that even when they’re filtered through a wastewater plant, they cannot be extracted out of the water. In other words, microbeads end up permanently in our waterways, effecting the health of fish and, consequently, human health, as we eat the fish. Luckily microbeads will be banned in cosmetics sold in Canada starting this coming spring. You can learn more about microbeads on the Story of Stuff Project website. 3. Parabens (e.g. methylparaben, ethylparaben, propylparaben, isobutylparaben, butylparaben and benzylparaben): This toxic chemical easily penetrates the skin and has been linked to interfering with hormone functioning, DNA damage and breast cancer. Luckily, parabens will be banned for use in cosmetics in the EU, but not in other countries such as U.S.A. and Canada. It is estimated that women are exposed to 50 mg of parabens per day. Parabens might be closer than you think and in your daily foundation, shampoo or lotion. Now the question is what do you do after you’ve read the ingredients in your soap and find a few unhealthy chemicals? 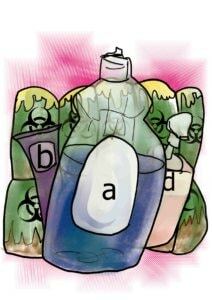 Do you throw away your favourite soap or continue to use it? The next time you shop for soap, read the ingredients list and search for these chemicals. There are many more unhealthy, disease-causing chemicals than just those in these three categories, but the ones I’ve listed are the most common chemicals that the average person should know about.